360 Degree Advocacy is a high impact, efficient model for professional advocacy. The model provides a structured method for coordinating national and state level organizational resources, and best practices from previous, parallel advocacy activities. National content experts, state level leadership, and state level advocates are put together on a 360 Degree Advocacy Teams. The IOPC has published a paper describing the model, "360 Degree Advocacy: A model for High Impact Advocacy in a Rapidly Changing Healthcare Marketplace"
When a threat to patient access to neuropsychology services or to the neuropsychology practice climate is identified, the InterOrganization Practice Committee identifies best practices from similar, previous advocacy efforts. 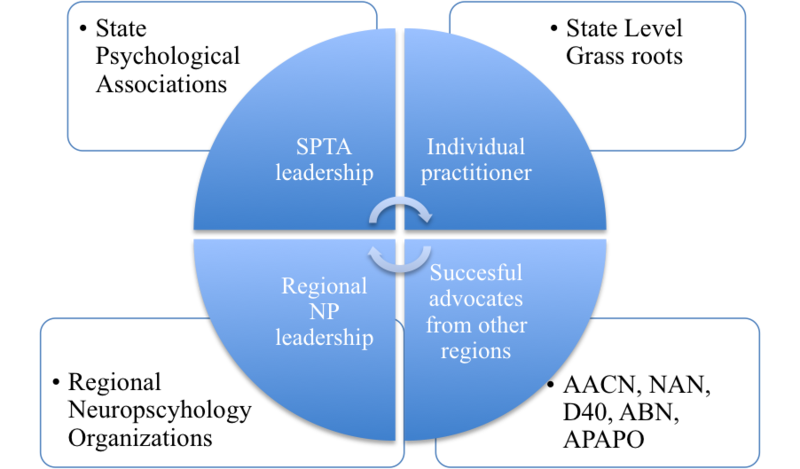 A team is assembled of individuals experienced with similar advocacy efforts who know the ropes, as well as state level decisions makers (presidents and executive directors of State Psychological Associations/ regional Neuropsychological Societies) who facilitate rapid roll out of advocacy plans, and individual state level neuropsychologists who have a significant stake in the outcome. This structured team composition results a rapid advocacy responses, using best national practices, with buy in and “boots on the ground resources” from local clinicians and state level leaders.